HIV, or the human immunodeficiency virus is a virus that left untreated may lead to acquired immunodeficiency syndrome or AIDS. Unlike some other viruses, even with treatment some people infected with HIV may never eliminate the virus. In an animal model of HIV, within 24 hours of infection, the virus hitches a ride on immune cells and travels throughout the body. HIV has a special propensity for immune cells, especially T cells. T cells help the body fight infections by activating the production of antibodies (large molecules that neutralize pathogens) and triggers inflammation to kill pathogens or destroy cells containing microbes. 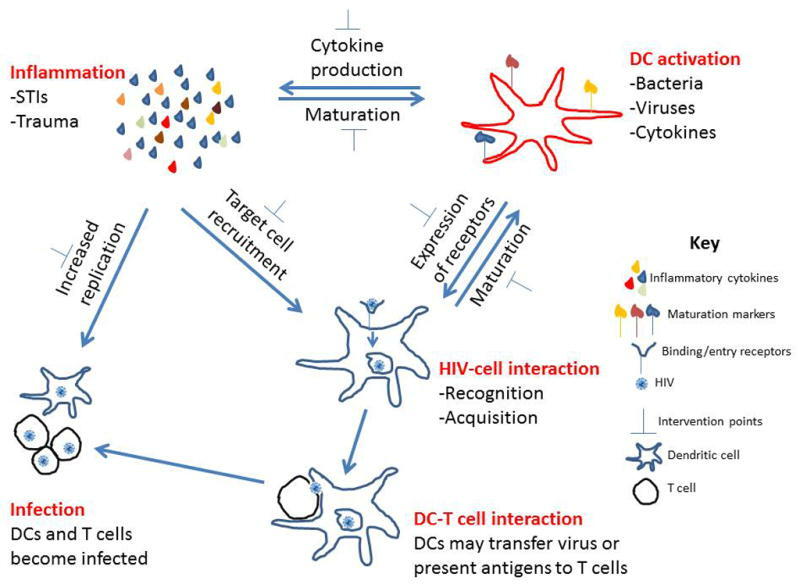 Left untreated, HIV infection reduces the numbers of defensive immune cells in the body, leaving HIV infected people (HIV positive) highly vulnerable to infection with other foreign agents (opportunistic infections) and cancers. DC (dendritic cell)- A type of immune cell that plays a primary role in infections with HIV. They are important regulators of immune system responses to infection. From 80-90% of immune cells are found in the walls of the intestines and in the tissues surrounding the intestines. HIV tends to accumulate in these tissues and attack them. These inflammatory responses may weaken the gut barrier resulting in inflammatory digestive issues for HIV positive individuals. “Inflammation and immune activation accelerate heart disease and stroke, and chronic HIV infection results in both,” says Robert T. Schooley, AIDS researcher and Professor of Medicine in the Infectious Diseases division at the University of California at San Francisco. In addition, this population is at increased risk for certain cancers, gastrointestinal, liver and kidney problems. There are no cures for HIV, but with proper medical care, the numbers of virus infecting a person and their symptoms may be controlled. Proper medical treatment dramatically improves and prolongs lives. Anti-retroviral therapy (ART or ARV) is used to treat HIV infections. The body must be in immune balance, in immune homeostasis to protect the body from infection or fight infections. The immune system must produce the right ratio of inflammatory cytokines (pro-inflammatory) to anti-inflammatory cytokines. It needs enough inflammation to destroy the pathogen, or in this case HIV, but not so much that healthy tissues are damaged. A recent study of people that have been treated over many years for HIV reports that HIV positive individuals are at a higher risk of getting diseases common to older individuals. Individuals that were infected in the early years with HIV are now in their 50s and 60s and develop inflammatory-related conditions at a significantly higher rate and lower age than uninfected people of the same age. The key to staying healthy is to remain in immune homeostasis, immune balance—this is true especially for people with chronic infections such as HIV. Please contact Dr. Hellen if you wish to enhance your quality of life-don’t you deserve to do that? The first 30 minutes of discussion are gratis. Dr. Hellen may be contacted by using this form or calling: 302.265.3870 (ET-USA). Nearly every day people tell me that their joints are swollen and stiff, they hurt all over, and that they look and feel older than their chronological age. Most of these individuals have been diagnosed with rheumatoid arthritis. Arthritis is a sign of a “boosted” immune system with excessive inflammation leading to joint damage. People report pain in areas such as their backs, fingers, hands, wrists, knees, and shoulders. Rheumatoid arthritis typically affects the joints of the body. However sometimes even before joint symptoms appear, rheumatoid arthritis can involve other parts of the body including the lungs or eyes. Long-term inflammation of the lungs leads to scarring and shortness of breath, fatigue, weakness, and an on-going, chronic dry cough. If the pleura, the tissues around the lungs, become inflamed, fluid buildup may result in fever, pain when taking a breath, and difficulty in breathing. Clinicians, and most lay people, focus on the harmful aspects of inflammation and try to stop the inflammatory response at all costs. Instead, all that is needed is to control the this immune response. The process of inflammation is normal, protective, and absolutely essential for our survival. Inflammation is the first step to healing after an injury or when the body is gathering its forces to stop an infection. Immune inflammation also helps the body destroy cancer cells before they grow and multiply. When the body recognizes it has been injured or infected, the immune system releases antibodies and cytokines, smaller proteins that attract different types of immune cells into an area, to help eliminate and destroy threats to the body. Once healing has started, the amount of inflammation that the body produces must be controlled. The genes that control inflammation have to be “turned off”, down-regulated, so that inflammatory responses are limited. Arthritis is one of many autoimmune disorders in which the body mistakenly produces autoantibodies, antibodies against its own tissues that attach to joint linings, and cartilage which acts as a shock absorber. The presence of autoantibodies may trigger immune cells to release inflammatory molecules that cause damage to the joints and other organ systems. There are many factors that contribute to the discomfort experienced by individuals with joint issues. Two of these most recently investigated are: stress and weight. The body increases the amount of inflammation it produces when it is exposes to constant stress and the stress of pain. It becomes part of a vicious cycle. Stress causes inflammation, and inflammation leads to more stress. There is crosstalk between the nervous, hormonal, and immune systems. Changes in one system effects the other system. Stressed individuals suffering from rheumatoid arthritis produce much higher levels of most cytokines than people without arthritis. Immunologically they respond differently to stress. Overweight and obese patients with rheumatoid arthritis have more pain and respond less well to medication, as compared to normal weight patients. Obesity is an inflammatory disease during which fat cells, especially those concentrated around the inner organs, pump out large numbers of inflammatory molecules. Certain inflammatory proteins are found in high number in the abdominal fat tissue of overweight and obese individuals. Immune inflammation is tightly regulated by the body. It consists of a) triggering and maintaining inflammatory responses, and b) producing immune messages that decrease and/or entirely stop the inflammation. Imbalances between the two phases of inflammation results in unchecked inflammation, loss of immune homeostasis, and may result in cell and tissues damage like that experienced in rheumatoid arthritis. The key is to incorporate lifestyle changes to help the body maintain immune balance. Help your body return to immune balance. Dr. Hellen may be contacted at: 302.265.3870 ET USA, or use the contact form. Thank you. People who are heavy and are not physically active, are at greater risk for conditions such as: increased blood sugar, higher pressures on their artery walls (high blood pressure), increased rate and workload on the heart, stroke, joint problems, sleep disorders, difficulty breathing, and even certain types of cancer. There are other posts on this blog relevant to the issue of being overweight or obese, but there is little question that most individuals would feel a lot better if they were only 5 or 10 pounds lighter. When compared to leaner people, adipose tissue, the fat deposits of obese individuals, have higher numbers of, and larger, fat cells. These cells produce cytokines, immune factors, that are inflammatory in nature and trigger numerous inflammatory conditions including many mentioned above. Adipose tissue has “immune-like” properties. For example, macrophages, white blood cells which alert the body to the presence of invaders, are found in high numbers in fat cell clusters. Additionally, obese individuals have been shown to have increased levels of proteins in the blood stream that stimulate inflammation. Overweight or obese people do not fight infections or heal as well as individuals at more appropriate weights. The following hypothesis may have validity. The immune system may “see” components of adipose tissue as “foreign material” that must be eliminated from the body. If this scenario is correct, when the body “battles” adipose tissue an autoimmune response is triggered, a response in which the immune system destroys its own tissues, resulting in high levels of inflammation. My hypothesis is supported by the fact that obese individuals produce high levels of autoantibody, antibodies against their own tissues. Rather than resulting from inflammation, these autoantibodies may be the trigger for inflammation. Muscle cells, like fat cells, secrete cytokines, molecules which help the body regulate inflammatory responses. In response to exercise, many different types of cytokines are produced by muscles and other cells. Cytokine measurements taken after a marathon demonstrated 100 fold increases of certain cytokines, whereas other cytokines were produced that typically dampen an inflammatory response. The wide spectrum of immune factors that the body produces in response to physical activity helps the body maintain a steady state of inflammation, an immune balance that helps the body defend itself against infection and helps healing, but not so much that innocent by-stander tissues are damaged. In fact, studies have shown that individuals that are overweight, nevertheless may be healthy, if they are maintain a level of physical fitness. The bodies of overweight and obese individuals are consistently exposed to self-generated, inappropriate levels of inflammation. Helping the body return to a healthy balance of immune responses, a state of homeostasis, will go a long ways towards changing their quality of life. I would be pleased to hear from you if you are interested in changing your quality of life. I can be contacted at: drhellen@drhellengreenblatt.info or at: 302.265.3870 USA ET. Immune inflammation is the body’s way of protecting itself from infection and cancerous cells. It is also necessary for repairing damaged tissues and eliminating dangerous compounds produced internally or to which we are exposed to externally. In the 1800’s, Dr. Rudolf Virchow, one of the 19th century’s foremost scientists, observed the presence of inflammatory immune cells in cancerous tissues and suggested that there was a connection between cancer and inflammation. The right balance of inflammatory responses are needed to fight cancer. Too little of an immune response leaves cancer cells unrecognized and unchallenged. Too much inflammation, or going down a different pathway of immune cell stimulation, may cause the immune system to support tumor growth rather than go into an “attack” mode. Immune and digestive homeostasis, intestinal balance, depends on the right types and numbers of microbiota (bacteria), the health of the cells that make up the intestinal lining, and the immune cells that are embedded in the intestinal walls. Over 75-80% of the immune system is represented in the gut. The immune cells produce antibodies (immunoglobulins), cytokines, and other immune factors that help protect the digestive system from pathogens that are introduced into the gut when consuming food and drink. Bacteria and their secretions interact with intestinal immune cells and vice versa. These bacteria play a major role in the health of the digestive tract. An inappropriate level of intestinal immune responsiveness and incorrect types and numbers of microbiota may contribute to difficulty in maintaining intestinal homeostasis, gut balance. Immune imbalances, a breakdown of any of these elements, lead to problems with the intestine such as inflammatory bowel disease or cancer. Pre-cancerous polyps often precede the development of colorectal cancer. Several naturally occurring substances have been shown to reduce the size and number of polyps, probably by down-regulation of genes that cause inflammation. Maintaining immune and digestive homeostasis is imperative for good health. I look forward to having you contact me about any questions you might have on limiting inflammation and returning to homeostasis. I can be contacted at: DrHellen@DrHellenGreenblatt.info or click on: http://drhellengreenblatt.info/contact-dr-hellen/. You may also reach me at: 1.302-265.3870 [USA, Eastern Time]. People often ask how they ended up getting an autoimmune disease, a condition in which their own immune system turns on themselves and destroys healthy by-stander tissues and organs. My response-the not-yet-proven-hypothesis that molecular mimicry results in autoimmune disease. Molecular mimicry is a phenomenon in which tissues in the body share a “barcode”, antigenic receptors, with specific viruses or a bacteria. The immune system responds by mounting an inflammatory attack against the invading pathogen. This response targets not only the pathogen, but in addition, tissues that share the same antigenic makeup as the invading microorganism. In short, a terrible error occurs and the body starts destroying itself. The inflammatory disease rheumatic fever is an excellent example of the possible outcome of molecular mimicry. Damage of heart valves may occur after infection with the bacteria Streptococcus. This development accounts for the panic that many parents experience when their kids come down with “strep throat”. Antibodies, large unique proteins, are produced by the immune system when the body is exposed to pathogens. These specialized proteins attach to the invaders, “flagging” them for destruction by circulating immune cells. In the case of rheumatic fever, since bacteria and heart valve tissue look alike to the body, antibodies are produced that attach to both surfaces, triggering inflammatory immune responses ultimately resulting in damage to heart valves, as well as death of the bacteria. The data, controversial, but compelling, is that molecular mimicry, due to viral and bacterial infections, may also be a trigger for neurological disease. This concept is reinforced by the fact that multiple sclerosis is a condition in which nerve cells are damaged by uncontrolled levels of inflammation. Immune cell products mistakenly attack myelin proteins, which make up the protective sheath that “insulates” nerves. Damage to this covering results in nerve signals becoming intermittent, slowing down, or stopping entirely. Such nerve damage affects vision, mobility, coordination, balance, bladder, or bowel control. A large body of data suggests that infection with herpes virus 6 and/or Epstein-Barr virus triggers inflammation that leads to nerve cell destruction. Different viruses and bacteria have been implicated as initiating inflammatory responses in other neurodegenerative diseases as well. To understand the role of excessive inflammation in your own condition, enter the condition in combination with the word “inflammation”. The results you receive will help you understand the importance of achieving immune homeostasis, immune balance of our inflammatory responses. Last week John Gever, Senior Editor, MedPage Today brought attention to the results of a small study presented at the 2012 Alzheimer’s Association International Conference held in Vancouver, British Columbia. In this study, patients with mild to moderate Alzheimer’s were given antibody preparations, immunoglobulin preparations, which were obtained by pooling plasma from numerous blood donors. This sterile, medical product, IVIG, intravenous immunoglobulin, consists mostly of immunoglobulins, antibodies, and is administered intravenously (IV). The FDA, The U.S. Food and Drug Administration, has approved the use of IVIG for only six conditions. However, it has been used “off-label”, to try and treat about 50 other conditions, including infectious diseases, a wide-range of autoimmune conditions, organ transplant and cancer patients, blood, and neurological conditions to mention a few. When practitioners are asked how s/he thinks IVIG works, the response is typically, except for infectious diseases, “we are not sure”. IVIG contains antibodies to organisms such as streptococcus, hepatitis, measles, polio, etc., that can specifically neutralize infectious agents. Other immunoglobulins may be directed against specific immunological factors. However, viewing reported results in chronically ill populations, I have always been of the opinion that IVIG also contains cytokines, or cytokine-like immune molecules, with potent immune system-modulating properties, which help the body return to immune homeostasis, immune balance. I suggest that the reason that Alzheimer’s patients receiving IVIG saw a stabilization of their symptoms, is that IVIG limited inflammatory responses and thus slowed the progression of disease. This supposition is further supported by the fact that animal models suggest that excessive production of inflammatory cytokines, inflammatory messages, are implicated in Alzheimer’s disease. These animals have a condition similar to human Alzheimer’s, and also have higher levels of inflammatory cytokines in their blood. When a drug was administered that inhibited the cytokines, there was less damage to nerve cells and neurological outcomes in the animals improved. Thus improvements, or at least delay in the onset of Alzheimer’s, or other brain –associated conditions, may be associated with the body achieving immune homeostasis. A body in inflammatory balance controls the immune system’s inappropriate inflammatory responses which otherwise may lead to damage of bystander tissues. Recently, a professional networking site directed me to a short note by Lisa Moreno-Dickinson, President of the stopcaidnow.org. The title of her article was “When Doctors Don’t Know How to Help From Misdiagnosis to No diagnosis … What Can a Parent Do?”. CAID refers to Childhood Auto Inflammatory Diseases. These genetic disorders usually start in infancy or childhood and are reported to be the result of gene mutations. The periodic attacks of these conditions affect many different organ systems. They are characterized by sudden inflammation and fever onset, and symptoms such as rashes, headache, abdominal, chest, muscle, and joint pains, swollen joints and scrotum. Much of the science suggests that these conditions are not autoimmune in nature. These individuals have no any significant elevations of autoantibodies, immunoglobulins, large immune molecules that are directed against self, nor activation of specific white blood cells. Our knowledge of the complexities of the immune system, especially its inflammatory pathways, are still in their infancy as supported by the fact that cancer, colds, infectious, and chronic diseases are rampant. I respectfully suggest that perhaps autoinflammatory investigators have not used the appropriate assay to find autoimmune responses because a) it does not exist yet, or b) it is difficult to “test for everything”. A recent report suggests that there is an association between autoinflammatory conditions and mitochondrial health. Mitochondria are the power stations of a cell that provides it with the energy it needs to grow, divide, and “do its job”. They play major roles in healthy aging, degenerative diseases, cancer, and ultimately, cell death. The greater its metabolic or energy requirements, the more mitochondria a cell appears to have. As an example, a muscle cell may have thousands of mitochondria and a skin cell only a few hundred. Antibodies to mitochondrial proteins have been reported in autism spectrum disorders, which are attributed to inflammatory conditions of the nervous system. Additionally children with severe autism have higher levels of inflammatory cytokines and certain immune molecules than controls. In Blau’s syndrome, an autoinflammatory disease, symptoms are associated with the skin, joints, and eyes. It is often mistaken for sarcoidosis, a known autoimmune disease of the skin and other organs. Crohn’s disease is an inflammatory autoimmune bowel disease in which the immune system attacks its own digestive lining. There are two genes, NOD1 and NOD2 that help regulate the production pro-inflammatory cytokines, immune molecules that cause inflammation. Mutations of these genes are found in a number of inflammatory disorders including Blau’s syndrome, sarcoidosis, and inflammatory bowel diseases. Investigations of the pivotal role of gene regulation of inflammatory responses are underway; however, ways to neutralize the effects of such mutations may be years away. Parents and clinicians do not have the luxury of just waiting. We know that inappropriate inflammatory responses are occurring in many, so why not determine whether the re-introduction of immune homeostasis, immune balance would make a difference in their quality of life?